The Swiss stamps photographed at an angle to reveal the texture. Switzerland issued two 1-franc stamps June 1 to mark the opening of the Gotthard Base Tunnel. Rock dust from the tunnel’s construction was applied to the stamps. This Rock of Gibraltar stamp includes limestone from the famous landmark. A 2006 souvenir sheet from Austria has actual meteorite dust embedded in the design. Two recent stamps from Switzerland not only commemorate the opening of the world’s longest and deepest traffic tunnel, they also contain actual rock dust from the tunnel’s construction. The Gotthard Base Tunnel opened June 1, and Swiss Post issued the two stamps on that day. The world-famous Alps region of central Switzerland creates a magnificent landscape for winter sports and resorts. Historically, though, this landscape has made travels within the country and connection from north to south difficult. With an astonishing tube length of 35 miles, the Gotthard Base Tunnel solves this transportation problem. In constructing this tunnel, roughly 28 million tons of material were removed from the Gotthard Pass, of which around 33 pounds went to Swiss Post for the stamps. The rock was ground into dust and then applied to the stamps using a special printing method and finish, or varnish. The textured finish can be seen more clearly on the oblique view of the stamp sheet. 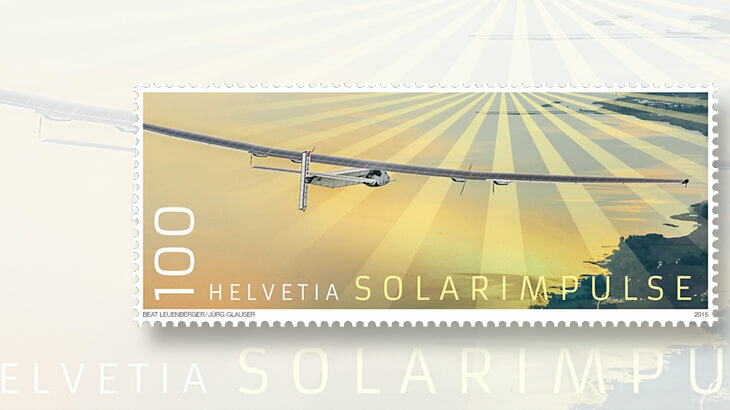 Swiss stamp honors round-the-world flight of solar-powered aircraft: One day after the completion of the first round-the-world trip in a solar-powered aircraft, Swiss Post issued a stamp paying tribute to the pilots. The two 1-franc stamps are connected by a label. These three elements form a single, continuous design, sometimes called a triptych. There have been several precedents of real rock or sand being applied on stamps. On Sept. 15, 2002, Gibraltar issued a se-tenant strip of four Rock of Gibraltar stamps including actual pieces of the famous landmark (Scott 971). How appropriate to print Rock of Gibraltar stamps made from the rock itself. It also was a great way to recycle material that had been dug out. Also on Sept. 15, 2002, Hong Kong issued a souvenir sheet and a set of stamps with the same feature (Scott 994-997). The texture of the rocks are clearly exemplified in the composition of these four Hong Kong stamps, with a corner of each design showing an enlarged part of the rock, as well as feeling like the rock. The sensation of a stamp that can be felt brings another dimension to the printed stamps. Similarly in 2007, Thailand issued a souvenir sheet and four stamps featuring rock formations in Pa Hin Ngam National Park that were printed with a stone/sand texture adding another dimension (Scott 2301-2304). A souvenir sheet of two stamps issued by Morocco Nov. 6, 2010, contains sand collected from sand dunes of the Moroccan Sahara (Scott 1115). The sand is affixed to each stamp and also at the bottom of the stamp sheet. The issue celebrates the 35th anniversary of the Green March, an important day in the history of the country. The stamp (Austria Scott 2042) contains 0.03 grams (0.001 ounce) of genuine dust from a meteorite. Uncovered in the Morocco dessert in 2004, the meteorite weighed almost 42 pounds. The process of thermography is commonly used on letterheads, business cards, and other documents in order to give it a high-end feel and different finish from text or images with traditional printing. In the future, in addition to featuring rock subjects, perhaps this technology will be used in other ways. For instance, it could be used to mimic relief sculpture on stamps, giving them a truly three-dimensional feel.